I follow quite a few blogs by some very creative people. I am always challenged and inspired by the level of talent that is out there. I am also humbled by the kindness and willingness give advice that these artisans are willing to share with others. One of the interesting aspects of these communities of artists is the frequent opportunity to participate in a variety of challenges. These challenges help you stretch and grow as a creator and perhaps try something you wouldn't have tried before. 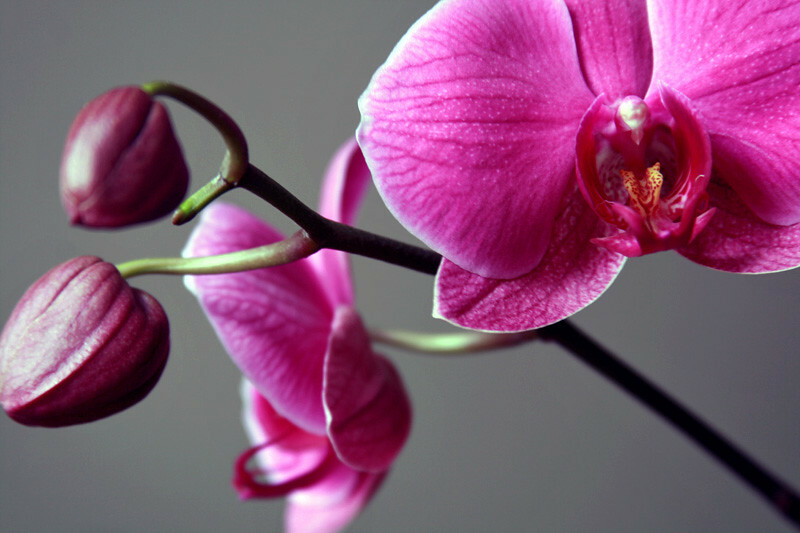 Art Jewelry Elements had a challenge in May to create a piece inspired by this lovely orchid in the photo below. I love gardening but was always intimidated by orchids. That changed when we moved to Guam. There orchids almost grow like weeds I had several that were growing out of a coconut husks that hung like planters from my patio. I am in the midst of a move from Northern VA/DC to Norfolk, VA so my supplies and shop are packed up and I am limited in my ability to create. Therefore I am taking a bit of liberty here and using a set that is currently available in my shop. Mother of pearl rounds combined with fluted silver plated rondelles and silver bugle beads and fuchsia seed bead accents mimic the lovely fuchsia of the orchid. Thank you for indulging me this time out, I hope to participate fully next month once my workshop is back up and operational. Since this is a " BLOG HOP"
Check out the other participants with the information below and see how they interpreted 'Pink Orchid'. The color is dead on! Jealous that you lived someplace where orchids grow like weeds.... Good luck with your move! It's so sad to have all your toys packed away.